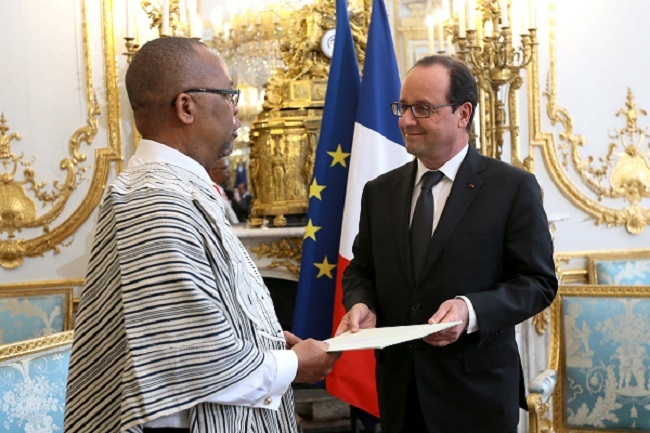 Liberia’s ambassador to France Dr. C. William Allen has presented his letters of Credence to French President Francois Hollande. The présentation ceremony took place on Tuesday, July 8, at the Elysee Palace, the seat of the French Presidency. Ambassador Allen said Liberia remains grateful to the people of France for their many support to Liberia during the period of recovery from the 14 years of civil conflict. He said French financial and material contributions to the UN Peace-keeping Mission in Liberia (UNMIL) and their support for Liberia’s debt waiver, donation of non-lethal weapons to the Liberia National Police (LNP) among other support to other Liberian institutions. Ambassador Allen welcomed the recent decision of the French Development Agency(AGENCE FRANCAISE de DEVELOPMENT) to resume activities in Liberia with support for the country’s energy sector, particularly in the areas of transmission and distribution. Ambassador Allen said Liberia would like to see more French support for programs that promote regional integration and unity amongst Mano River Union and ECOWAS countries such as infrastructure projects funded by the African Development Bank (AfDB). Ambassdor Allen called for more support to the Institute of French Studies, Alliance Francaise, an institute that promotes and provide instruction in the French language and culture. He said Alliance Francaise has played a key rôle in educating Liberian students, educators and diplomats in the French langauge thus promoting the understanding of the French language among Liberians. He also urged the French Government to consider expanding its Consular Services in Liberia to include the issuance of schegen visas. Ambassador Allen extended gratitude to President Ellen Johnson Sirleaf for the confidence reposed in him to be appointed as Liberia’s Ambassador Extraordinary and Plenipotentiary to France and assured the Liberian President that he will uphold the confidence and above all go beyond the call of duty to represent the interest of the Republic of Liberia. Receiving the letters, French President Hollande in a brief remark lauded President Ellen Johnson Sirleaf and the people of Liberia for assisting to restore peace in Mali by contributing a peace-keeping contingent to that sisterly West African Country. President Hollande said the Liberian peace-keeping contigent is helping to restore peace in Mali and their efforts are worth commendations. President Hollande added that the presence of the French Development Agency in Liberia will further promote France-Liberia relations and assist Liberia in its recovery. Liberia and France have enjoyed cordial relations since 1852 when France recognized Liberia as an independent country. Ambassador Allen is former president of the Press Union of Liberia, former director general of the Civil Service Agency and minister of Information, Culture and Tourism of Liberia. He holds Doctor of Philosophy,Ph.D (Mass Communication) Syracuse University, USA, a Master of Public Administration (MPA) California State University and Bachelor of Arts Degree in Journalism from the Pulliam School of Journalism, Franklin College. Ambassador Allen took up his post in Paris, France in March this year.